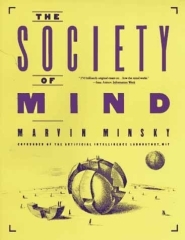 Twenty years we have been waiting for a Society of Mind II. 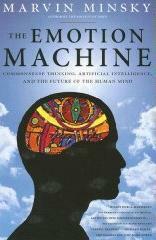 The waiting time is finally over: in his book with the title “the emotion machine“, Minsky tries again to explain how the mind works. A good book with interesting ideas, but unfortunately also a bit disappointing: emotions are certainly important, but they are not the thing which makes humans special. Isn’t every animal an emotion machine? Every animal does not only feel the own state of the body through emotions, it is also controlled by emotions. There is one thing only humans have: humor and laughter. Yet there is nothing about computational humor in this book. Nothing about the “metaphors we live by”, either. The most interesting idea is perhaps to introduce the “critics”. Minsky proposes a “critic-selector” model of the mind, where a number of critics evaluate situations to activate certain selectors, which in turn activate or deactivate clouds of agents. The modulation idea is not bad, although it is not very new or original. Yet critics are a good cue: imagine for example a cartesian theater, where not a single self is sitting in the audience, rather the representatives of the body, like the members of a jury (the physiological counterpart maybe the limbic system and the brainstem). On stage there are agents which represent the current state of the world. The critics in the jury now evaluate every situation, and are able to choose between thumbs up and thumbs down. If they say “Yes, I want to see it again”, then the agents on the stage are likely to appear again, if they say “No, I don’t want to see it”. A nice picture: if a person falls in love, then the critics for love always want to see the same persons on the stage..
A book about emotions should examine the basic emotions, especially joy and pain. And from a successor of the popular “the society of mind” we have expected more. In his bestselling book the “Society of Mind“, he has argued that the mind can be described as the interaction of a diverse variety of mindless agents (which he calls resources in his new book). The society of Mind is certainly a wonderful metaphor and a very appealing model, if we we want to understand the process of thinking in all its intricacy. Is there a president somewhere? What happens when agents agree or disagree? See also our wiki page here.